Travel to Siargao Island an adventure in itself! Siargao Island is kind of, off the beaten track. It arguably has the best surf in the Philippines and is a favourite of surfers from around the world. If you are interested in surfing at Siargao, have a look here and here for other surfing sites around the Philippines. Siargao Island is located about 800km south east of the Philippines Capital, Manila. It is an island on the Pacific Ocean side of Mindanao, actually on the north eastern tip in the Caraga Region or Region 13. Siargao Island is one of the many islands that make up the Province of Surigao del Norte. 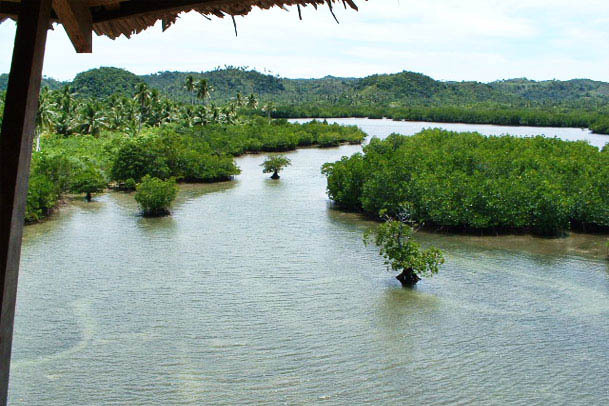 Mindanao is home to the largest mangrove forest in the Philippines, which may not mean much, but for the environment it is fantastic. How do I Travel to Siargao Island? Well you have a number of different choices to travel to Siargao Island. Asian Spirit one of the Philippines domestic carriers, flies to Surigao every Monday, Wednesday and Friday, it is a red eye flight, or early 06:00 am flight, the same flight returns to manila on the same days. The flight takes just under and hour and half. Once you are at Surigao City you will have to catch a ferry to Siargao Island, which will take roughly two hours. If you have arranged accommodation with one of the hotels, they will most likely come and pick you up from the airport. The ferry leaves from Surigao City Pier and docks on Siargao Island at Dapa Pier. If you want to travel to Siargao Island the slow way you can catch a ferry from Manila, please note it takes about 32 hours! Have a look here for the ferries which will take you there, check out either Super Ferry or Sulpicio Lines. If you are arriving in the Philippines via Cebu then you can catch the Asian Spirit direct flight to Surigao. The flight is under an hour's duration. You can take the overnight ferry from Cebu to Surigao City. It leaves at 7:00pm and arrives with the sparrows at 05:00am in the morning. From here you can catch a smaller ferry to Dapa Pier on Siargao Island.